I was recently sent this beautiful rose print skater dress from Sugarhill Boutique. 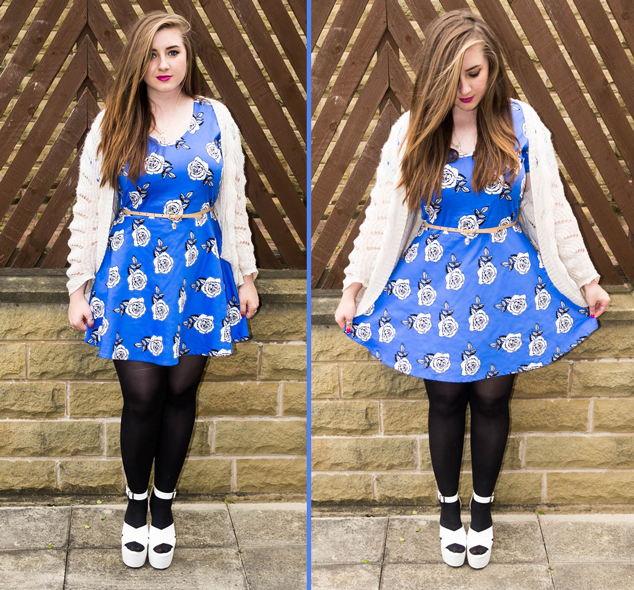 I love the prints used on Sugarhill Boutique items, I recently reviewed their gorgeous camera print dress, ‘Picture Perfect’ here. Sugarhill Boutique are one of my favourite brands. The clothing is always so quirky and unique and have never failed me on quality. The rose print Sugarhill Boutique skater dress is beautiful and vibrant with it’s large scale rose print, I love the contrasting bold colour. I need more colour in my wardrobe and to stop being so afraid of wearing it. It’s such a fresh colour for summer and a really flattering fit. The fabric is good quality cotten and keeps quite a structured flared fit. The Sugarhill Boutique Rose dress has a statement gold zip down the back and short sleeves, a good length if you are self conscious about your upper arms. The Fashion Union Wedge Shoes are really high shoes for me but are surprisingly comfortable and easy to wear. The shoes have a high platform with cross over straps to give a little open toe detail. I really like the ankle strap with buckle, this added detail is seen on so many shoes at the moment and I love this additional touch. As you know I have been loving Oriflame’s The One makeup range, you can see my write up of the products here. It feels good to get out of my wardrobe comfort zone with such a striking colour, how are you being daring with colours this summer?